The Dive Master 500 is authentic Swiss Army grade: direct and straightforward, with the critical attributes of a diving instrument, the uncompromising values of a trusted Swiss brand, and the distinct character of a watchmaking modern classic. For its 2012 re-launch, this rugged individual has gone through a dramatic sea change. Sleeker and more graphic, with a stronger, more immediate identity, the new Dive Master 500 collection combines resolute Swiss Army reliability and robustness with a very contemporary versatility. 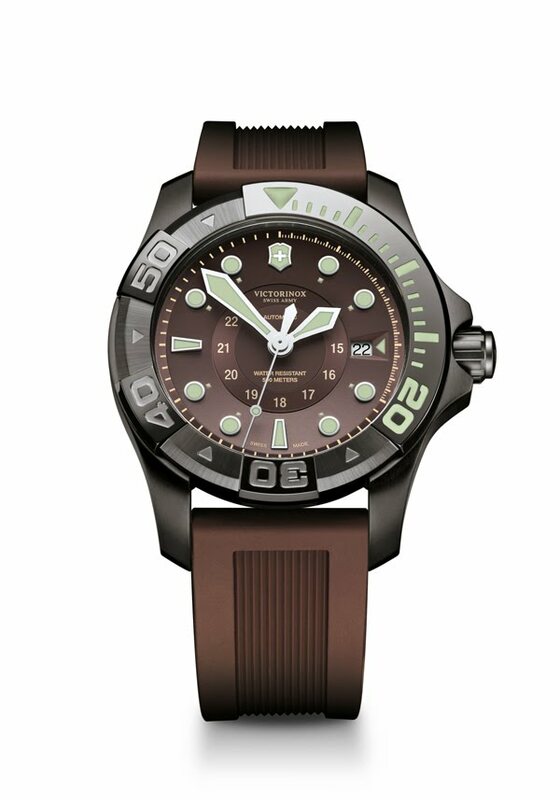 While the softerorganic color options — black, burgundy, brown, grey, khaki green and white —are drawn from nature, the classic round case is coated in “Black Ice” or gold PVD, as are the horns and the extremely graphic bezel. 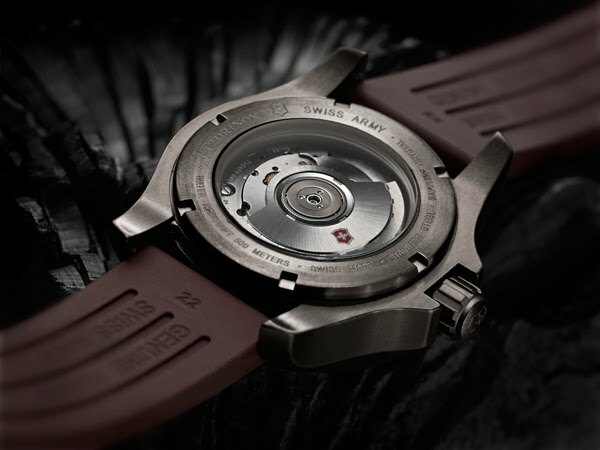 The innovative coating is a signature feature of Victorinox Swiss Army. The dial design is uncluttered, with fine vertical lines across the entire face except for a clean circle at the center indicating military time. The unidirectional bezel 20, 30 and 50 minute markings stand out thanks to the oversized Arabic numerals. The rubberized soft-touch background absorbs the light, creating striking contrasts with the raised and luminous baton and orb hour markers and iconic Victorinox shield. The minute hand, so crucial in measuring diving autonomy, is arrow-shaped; on some models it is bright orange — the splash of color gives a fresh and modern look. Different case sizes and colors are available: 4 quartz models in black, burgundy, khaki green (with gold PVD coating) or white, with a 38mm case size, 2 quartz models in white or khaki green with a 43mm case; and 3 grey, redorbrown mechanical editions, also 43mm. Shockproof and water resistant to 500 meters (1,640 feet), the Dive Master 500 is a stylish watch of outstanding quality. Adventurous and urban, it is built for serious work and play.